Crowds turned out in three separate parts of the UK last week as the childhood homes of three men who flew on the Dams Raid were honoured with plaques to mark the 75th anniversary of the raid. Third wave. Only aircraft to attack Ennepe Dam. Mine dropped successfully, but failed to breach dam. William Clifford Townsend was born on 12 January 1921 in Gloucestershire, the son of William and Kathleen Townsend. He went to Monmouth School. Shortly after the war started he joined the army, but then managed to transfer into the RAF in May 1941. He was selected for pilot training, qualified as a pilot early in 1942 and in June of that year was posted to 49 Squadron. He undertook two “gardening” operations during September 1942, and his first bombing trip was to Wismar on 1 October. By the end of March 1943, Townsend had completed 26 operations and been recommended for a DFM. His regular crew included five of the men who would fly with him on the Dams Raid: flight engineer Denis Powell, navigator Lance Howard, bomb aimer Charles Franklin, and air gunners Doug Webb and Ray Wilkinson. The crew therefore fitted precisely into the category from which 617 Squadron’s crews were supposed to have been selected. Quite why 49 Squadron chose to add the far less experienced Cyril Anderson and his crew to the transfer is not known. Townsend’s regular wireless operator Jack Grain declined the opportunity to transfer to 617 Squadron, as he was getting married, so when the crew arrived at Scampton they did not have anyone to fill this position. 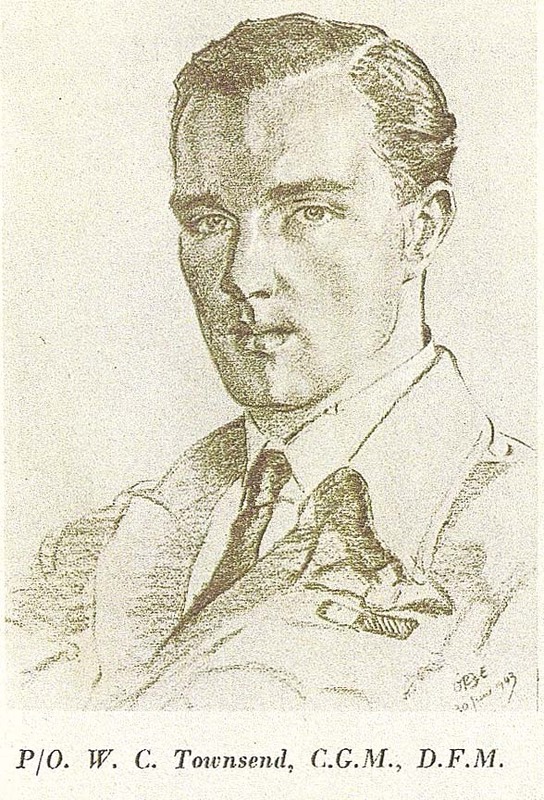 However, George Chalmers, a Scot who had already done a full tour in 35 Squadron, had arrived at the station without a crew, and was fitted in. Training went ahead throughout April and early May, but dummy Upkeep weapons were in short supply, so Townsend never actually dropped one before the raid. Instead, he flew as second pilot with Les Munro on one test flight at Reculver. Munro flew so low that when the weapon was dropped the resultant splash damaged the rear turret. So it was that Townsend took his place in the mobile reserve, taking off from Scampton at 0014. He had some difficulty getting the heavily-laden AJ-O into the air, just crawling over the boundary hedge. As they approached the Dutch coast, they saw flak far ahead on their port side, probably that which shot down Lewis Burpee and his crew. Turning correctly at the tip of Schouwen, they crossed the coast at 0131. At 0145, they received another warning about flak at Dülmen and almost immediately were caught in a searchlight. According to Lance Howard’s account Townsend “threw that heavily-laden Lancaster around like a Tiger Moth and we flew out of it.” Several more incidents followed in the next few minutes and at one point they flew along a firebreak in a forest, below the level of the trees. With all this activity, it is perhaps not surprising that AJ-O did not receive radio messages from Group HQ about the breaching of the Möhne and Eder. However, a message sent at 0226 was acknowledged. This ordered AJ-O to proceed to the Ennepe Dam. At about the same time, Ottley and Anderson were ordered to attack the Lister and Diemel Dams respectively. With hindsight, it would seem to be a tactical error by Group HQ not to have concentrated attacks by the mobile reserve on the most important remaining target, the Sorpe Dam. Indeed, a second message was sent to Ottley to change to this target but he had already been shot down. When AJ-O reached the Ennepe Dam, the crew found the target obscured by mist. Also, when they started spinning their Upkeep mine it made the aircraft judder alarmingly. However, after three attempts, they managed to drop it at 0337. Although it bounced twice, it exploded short of the dam which remained intact. Townsend hung around for a while waiting to see if others would arrive, but then set off for home. On the way they passed over the Möhne and saw for themselves the extent of the devastation already wreaked. With dawn breaking, AJ-O had an eventful journey back to base. As they approached Texel on the Dutch coast the Germans depressed a heavy flak gun on them and deliberately bounced shells off the water, a tactic which Lance Howard later described as ‘hardly cricket’. Townsend and George Chalmers later both recalled seeing the shells actually bouncing over them. Townsend turned to starboard and flew back towards Germany, before turning to port once more and finding a new track through the danger. On the way back across the North Sea an oil gauge showed that one engine was faulty and it was shut down. They finally landed at 0615, the last crew to return from Operation Chastise. They were met on the hardstanding by a group of Bomber Command’s most senior officers, including AOC ‘Bomber’ Harris, whom the exhausted Townsend failed to recognise and pushed past. It was however, as front gunner Doug Webb later recalled, a piece of ‘superb flying’ which had brought them home. Townsend was awarded the CGM for his role in the Dams Raid. Five of his crew were also given medals, making them the second most decorated Dams Raid crew after Gibson’s. He flew on just two further operations in 617 Squadron, both in July 1943 when the squadron was sent on raids on Italian targets with a stopover in Blida, Algeria. He had by then completed a full tour, and in September he was posted to a training role. He remained in the RAF until 1946. Bill Townsend married his wife Eileen in 1947 and they had three children. At one point he and his wife owned a pub in Oxford, but he later worked as a civil servant, including a spell in the Department of Employment in Bromsgrove, Worcestershire. Bill Townsend died in Bromsgrove on 9 April 1991. His funeral took place in Lickey Church, Bromsgrove, on 15 April and he was then cremated at Redditch crematorium. Survived war. Died 9 April 1991. I’ve written before about the post-war career of Douglas Webb DFM, front gunner in Bill Townsend’s crew on the Dams Raid. He went back to work as a photographer in the film and ‘glamour’ industry, where one of his subjects was the well-known model and film actress, Pamela Green. They had a long term relationship and eventually retired together to the Isle of Wight. Doug died in 1996, but Pamela survived him until 2010. Amongst the tasteful poses, there are some hidden gems of great interest to the Dambuster obsessive. 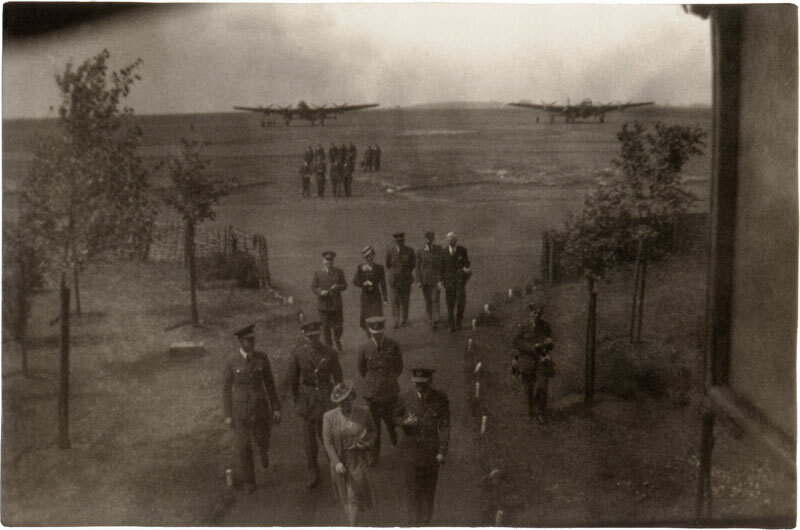 This includes a picture that I have never seen before, which must have been taken, presumably by Doug, on the day that King George VI and Queen Elizabeth visited Scampton after the Dams Raid, on 27 May 1943. They are walking off the airfield, probably en route to lunch in the Officers’ Mess. In the front row is the Queen, alongside a senior RAF officer. 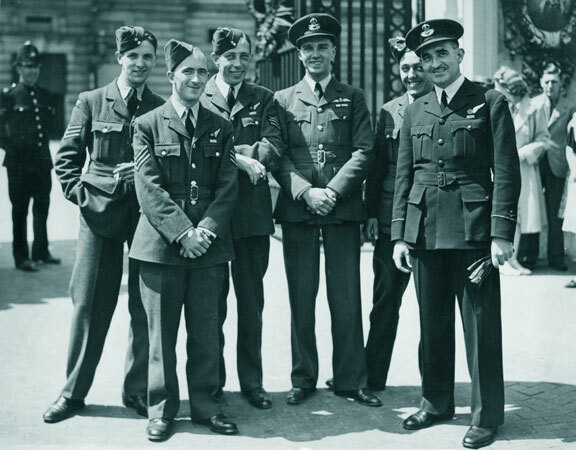 Behind them are a group of three, which I think includes Guy Gibson on the left, and the King in the centre. The third group of five has the unmistakeable figure of Barnes Wallis on the far right. I would hazard a guess that Charles Whitworth is on the far left of this quintet. Note also, the official RAF photographer on the far right. Any suggestions as to the rest would be very welcome. Another post in Yahya’s blog contains this picture of Doug Webb, Bill Townsend and the four other members of their crew who were decorated after the Dams Raid. This was taken outside Buckingham Palace on the day they received their medals, Tuesday 22 June 1943. The last pilot to land his aircraft safely on the night of the Dams Raid was Bill Townsend, pilot of AJ-O. He had been detailed as one of the five mobile reserves, taking off from Scampton at 0014 on Sunday 17 May. He was sent to one of the raid’s secondary targets, the Ennepe Dam, which he and his crew attacked — after three attempts — at 0337. Although it bounced twice, the mine exploded short of the dam which remained intact. They hung around for a while waiting to see if others would arrive, but then set off for home. They passed over the Möhne, saw for themselves the extent of the devastation already wreaked and then set off as fast as they could. With dawn breaking, AJ-O had a very hairy journey back to base. As they approached Texel on the Dutch coast the Germans depressed a heavy flak gun on them and deliberately bounced shells off the water, a tactic which navigator Lance Howard later described as ‘not cricket’. (You imagine that he was being ironic, given the weapon that they had bounced off the Ennepe lake a few hours previously!) They finally landed, with only three engines working, at 0615 and were met on the hardstanding by a group of Bomber Command’s most senior officers, including AOC ‘Bomber’ Harris, whom Townsend failed to recognise and pushed past. It was however, as his crew later recalled, a piece of ‘superb flying’ which had brought them home. Like so many of his generation, Bill Townsend was a modest man who rarely spoke of his part in the RAF’s most famous ever bombing operation. He surely deserves to be more widely celebrated.